I had the perfect outfit. Black shirt, business cut. Gray pants. Flat front. I had the perfect hair. Half up. No fly aways. A little oomph. Very teacher on her first day. Even Big Mama would have been proud. Oh, and the shoes. A Target special, but still dee-vine in every way. A divine that lasted until oh, about 8:30. And then there was pain. Thank you, dear first day shoes of mine. Thank you for reminding me that teachers need not fashion. Yes, that is my foot. 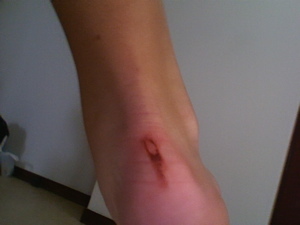 My poor, sad, used-to-run-without-hurting-too-badly foot. Well I would give you what I do on first days back in the classrooms when my mantra is “DO WHAT EMILY WITT WOULD DO,” which usually involves big smiles, jokes, and trying to have a big heart!! Oops I think I meant that confused comment for the blog below it about first days. Ha. I just woke up from a nap. A little groggy over here. But now that you’ve gotten the pain/embarrassment of the first school year out of the way, you can go ahead with the rest of the year!!! I hope today’s better for you! Did your shoes do that! Yard sale, back of closet, or just chunk them, whatever do not wear again. At first I thought that was your knee. That would have been extra bad. That’s why I always wear socks with my shoes. I feel no sympathy for you…… (leave it to me). What in the world were you doing wearing shoes you’d never worn before to school? Today I wore a pair that had never been worn… but I brought a BACK UP PAIR that I knew would be comfy. Have I taught you nothing????? Hey Witt! its raining in Tupelo today! One of those slow and long rain all day long days! Reminds me of a day at camp during a rainbow week where it rained most of the day and all we did was eat and dance underneath the pavilion! What a memorY! True joy! Anyway I miss our little talks and chats on Skype! We need to talk again some time! I wish you all the best for the rest of this week! I just tried on the new styles at Target myself. It took all of 1/2 a second to realize how painful that faux leather is. I really hope that’s not what you were wearing. This is super granny, but aerosoles are where it’s at for comfy shoes. What size are you? I can hook you up girl. Oh, and that makes me think of those RIDICULOUS granadino basketball uniform shorts and how PTA came running on the court stretching them out saying “SON GIGANTES!! !” Yeah, umm, I think that’s when you and I REALLY, truly bonded and became 5’4” blood sisters, who are like centers on a b-ball team in Colombia. ‘Member I got called for a foul for boxing out with my big booty? i think she flew across the court.